You have all waited patiently while my life changed with the arrival of my new slow cooker. Apparently, I am very late to this party. I had no idea there was this whole huge world of slow cooker devotees. There are even websites devoted to only slow cooker recipes. I could wallow in self pity right now, knowing that all these years I could have been starting my dinner first thing in the morning and then return at 6:00 pm to a fully cooked meal. I could think about all the fall apart tender meats I missed out on or the flavorful soups and stews that could have been. But who can be down when you’re in love? Not me, friends. Because I am in LOVE with my new slow cooker. I use the words “slow cooker” instead of Crock Pot because Crock Pot is a brand which I don’t have. But for all intents and purposes, they are used in the same way. 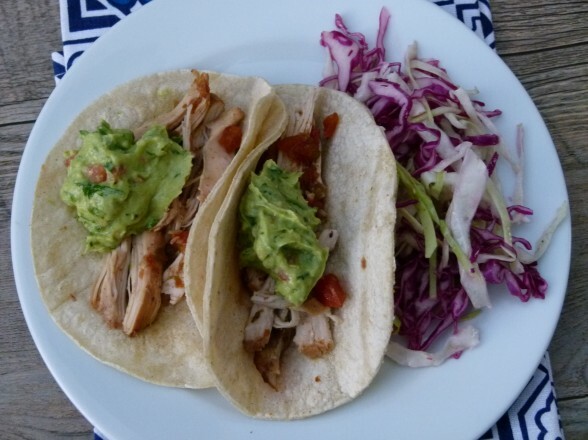 If you don’t have a slow cooker, I am not trying to sell you one here and I will provide directions in this recipe for how to make these tacos without one. But seriously people, this machine rocks. I don’t know what took me so long to get one. I think part of my resistance was that I don’t have any room in my kitchen to store it. I still don’t, but I did give away a box of Disney DVD’s in the garage to make space for it. (Shhhhhh!) I also never had a job where I left early in the morning and didn’t return until 6:00 pm to a house of hungry human beings. Until now. The irony is that I bought my sister a slow cooker a few years ago when she had her second baby because she does have a job like that. She has been raving about it ever since! A few months ago, I gave my other sister the same slow cooker when she moved into a new house and I think she just started playing around with it. But I’ve used mine a few times a week since mid-December and I’m hooked. 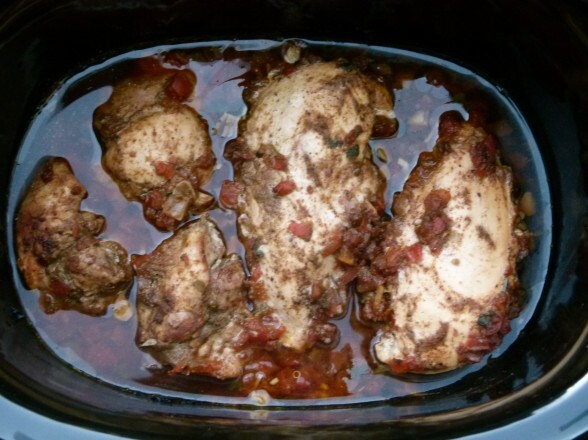 –slow cookers cook at low heat for longer time. Lower heat prevents nutrient loss. Also, cooking above 350 degrees (which a slow cooker does NOT) can create AGE’s (advanced glycation end products) which are very inflammatory to the body and considered carcinogenic (ugh.) Yup, you heard that right. Preparing food in a slow cooker is better for your health! –you can leave it unattended for up to 12 hours without overcooking your food or worrying about burning your kitchen down. 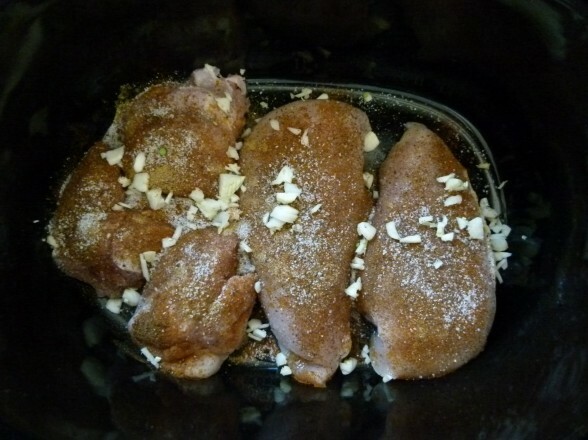 Again, I am new to slow cookers, and although I have learned a lot just by trail and error, I am no expert. But so far, I’ve noticed that I prefer the recipes that ask you to brown meat or saute vegetables before adding them to the slow cooker. You get much better flavor that way. Yes, I realize you’re getting another pan dirty, but it’s worth it and you’re getting it over with in advance. Also, I’ve made many non-slow cooker recipes in the slow cooker and just reduced the liquid a bit since there’s almost no evaporation happening and a lot of condensation. The recipe I’m posting today is a super easy one which I made on Sunday. This is truly a measure, dump and press start recipe. I used two different kind of chicken parts to see how they would both turn out and I’ll tell you the truth — although my family much prefers white meat, no one could tell what was what. Both the thigh and breast meat were super fork-tender. I personally think thighs have more flavor, but that’s just me. Everyone L-O-V-E-D these! I set up a taco bar with lots of toppings so they could just help themselves so I could sit on the couch with a cozy blanket and the new issue of Bon Appetit while watching the football game. Bliss. Slow cooker + Me = Together Forever! Any slow cooker love stories out there? I want to know it all — how and when you met, how you keep the passion alive, recipes for success, etc! Place the chicken in slow cooker and sprinkle with chili powder, cumin, chipotle powder, salt and pepper. Add garlic and salsa and rub around to combine. Cover; cook on high for 4 hours or low for 6-8 hours. 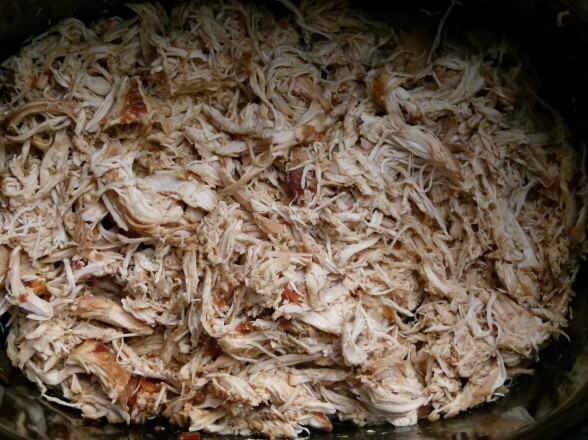 Either shred the chicken with 2 forks right in the slow cooker or transfer to a plate to shred. Moisten chicken with cooking juices and serve with desired tortillas/taco shells and toppings. 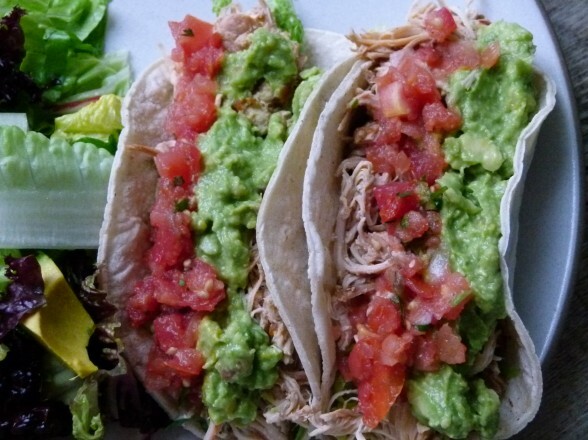 You could even serve the chicken over rice with salsa and diced avocados. Leftovers are great in a quesadilla! Oven method: preheat oven to 350 degrees. In step 1, place all ingredients (except accompaniments) in a 5-quart Dutch oven or ovenproof pot with a tight-fitting lid. Add 2 cups water or chicken stock. 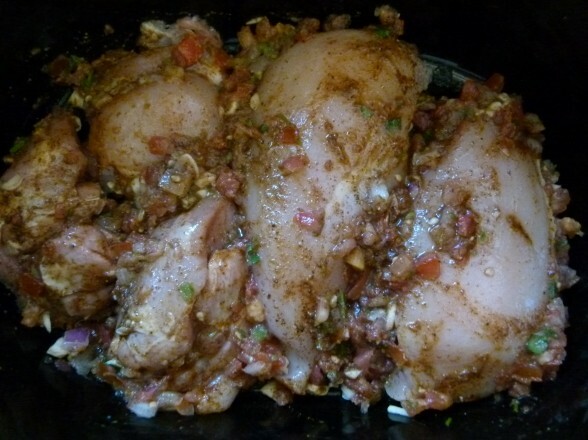 Cover and bake until chicken is fork-tender, about 2 hours. Proceed with step 2. I make this recipe frequently and recently purchased an Instant Pot. Do you have a modified recipe to accommodate the cooking time and any measurement changes with the ingredients? No need to change any measurements. If you use this exact amount of boneless, skinless chicken pieces, cook on high pressure for 9 minutes. If you double all the ingredients, try 12 minutes. Enjoy! Hi Pamela- I love all of your recipes (and your book of course! 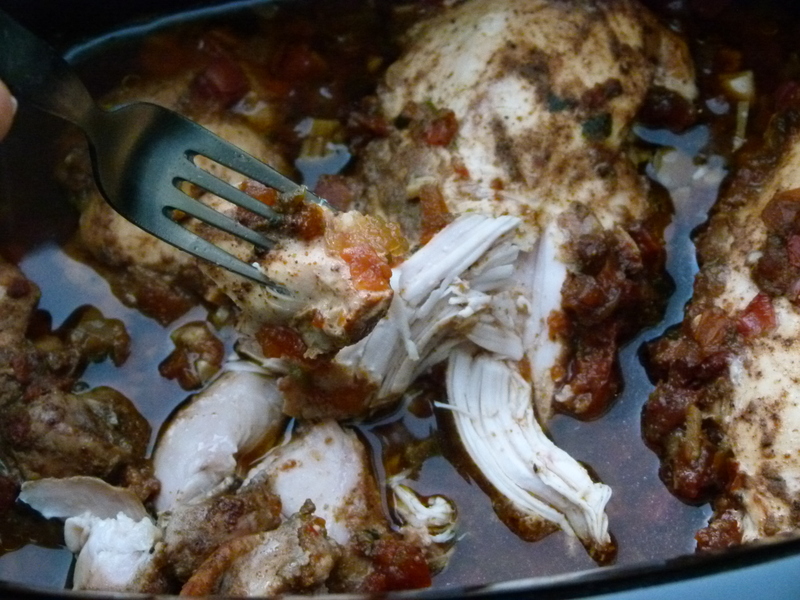 ), but was wondering how to make this recipe in an InstaPot. I think I saw it in your instagram stories at one point, but can’t seem to find it. Do you need to add stock to the instapot with the chicken (as you show for regular chicken in your saved instagram stories) or is the salsa enough? Appreciate the help! Also, any recommendations on which salsa to use? I don’t typically have enough time to make my own pico, so curious if there is a store-bought brand you like for this purpose. Thanks again! Looking forward to trying this one out! I love my crock pot but I”ve been reading various FB posts that say the ceramic inserts leach lead. Any info on this or recommendations for safe slow cookers? Thanks! Just made this recipe last night and, as usual, it was s complete hit. Delicious! Had a question on basics of how you deal with chicken. 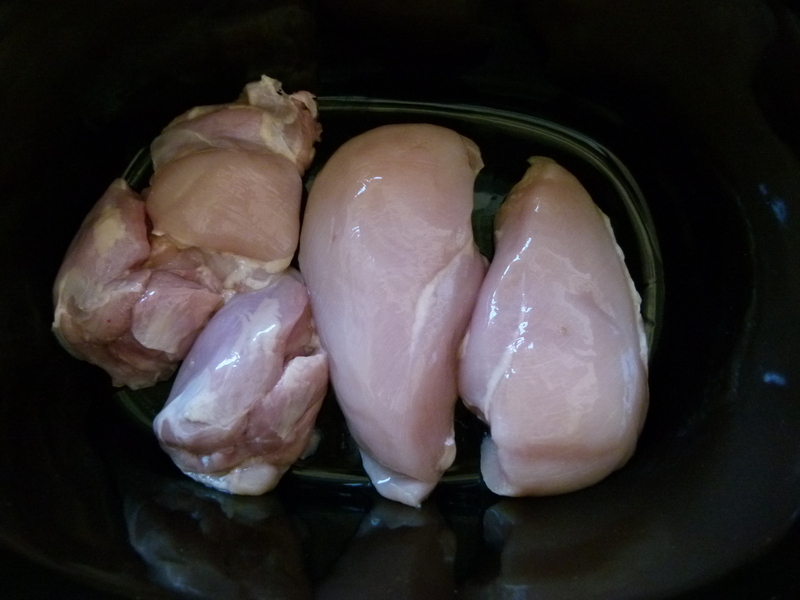 Do you wash your chicken breasts/thighs before cooking? Great! No I do not, unless they come prepackaged and they look a little “juicy.” It is not recommended to wash poultry since you’re not doing anything beneficial by washing it and most people will end up splashing bacteria all over their clean countertops and possibly clean dishes next to the sink. Just made this today and it is so delicious. I had to stop myself from eating the whole thing! Thank you. This was the perfect dinner to come home to after swim team! It’s a staple in our house. 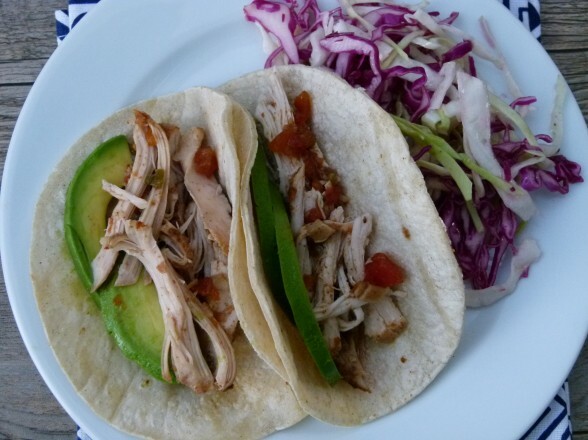 Makes for an excellent chicken burrito bowl and great chicken for enchiladas, too! Pamela, I love this recipe. It’s my favorite go to when we have guests in town. I pop everything into the cooker in the morning, we go to the beach or whatever the plan is that day and come home to a great meal. Like you, I’m late to the slow cooker party, but I’m loving it. This recipe was so great and so easy, thank you! I have a 6 quart slow cooker how many multiples of the recipe would you guess I could at once? “Guess” is the operative word here since I haven’t made more than one of the recipe at one time. If I were going to try doubling the recipe, I know the chicken breasts wouldn’t be in one layer, so I would go in there and rearrange them a bit halfway (bottom ones on top, top ones on bottom) if you’re around to do that. At the end of the programmed time, just check to make sure everything is cooked. I don’t think you’ll have a problem. Worst case, you’ll have to cook for a wee bit longer. Sound ok? Hi John – Wondering if you ever tried to do the recipe X3? I wanted to make for a party, and won’t have a chance to try it beforehand. Thanks! Woohoo! Another family hit from my 6 year old, to my 76 year old father. It was a hit all around and so easy that I am in shock! Funniest part was being at lunch today with a friend who was making the same thing tonight too! We both were eating lunch in the sun while our slow cookers were at home getting dinner done! This has become a very popular recipe in this town! 🙂 Thanks for sharing Rebecca! I made these last night and they were a hit. The chicken is delicious. I can’t get enough of your recipes! Super Bowl Sunday here I come!!!!!! Hope it was a fun and tasty day for you! The link to ‘my slow cooker’ didn’t work for me. Could you tell me the model of the All-Clad slow cooker that you use? I want to purchase one too. Thank you. I have the All-Clad 6 1/2 quart model and I bought my sisters the Hamilton Beach Set ‘n Forget. So far so good with mine and my sisters love theirs! Made these tonight. So delicious! These will definitely be added to our list of favorites. Thanks for the recipe. That’s great, Sandi! More slow cooker recipes to come! So glad you found me, Jenny! I am with you on avoiding non-stick as well as aluminum — yikes! I went with a ceramic interior for that reason (I have the All-Clad and I bought my sisters the Hamilton Beach). This does not brown food first, however, but I am willing to wash an extra pan when I need to in order to use a non-toxic material. I haven’t done extensive research on slow cookers to know if there’s anything out there that can brown, but isn’t made from aluminum or non-stick. Sorry! Sounds like a successful dinner — happy day! This was so good and so easy. I will definitely make this again. I chopped the garlic and measured the spices the night before. I just dumped it all in on my way out the door — doesn’t get any easier than that! I think this would be good with beef too — any suggestions on which cuts would work best? The easiest, right? I think flank or brisket would work well and I would let it go the full 8 hours. Let me know if you try it! I tried this recipe the other night and it was so delicious that it definitely will be a keeper for us! I used a can of tomatoes I canned during the summer with cilantro and red onion and the chicken really absorbed all that wonderful juice. We had ours with pinto beans and white rice in fresh tortillas – yum! Thanks so much for sharing! I didn’t realize there were so many bad slow cooker recipes out there, but this is something I’ve been hearing. I hope you enjoy this one! You had me at “tomatoes I canned during the summer.” Divine. Thanks for the recipe. It’s great to find a chicken recipe that doesn’t have to be cooked in a pan and then put in the slow cooker. That’s what most recipes I find require unfortunately, and I want easy 1-step. Please post more! I’m a huge fan. Thank you, Mark! Although I think sometimes that extra step creates great flavor, it’s hard to beat the ease of something like this recipe. Hope you enjoy! What other suggestions on spices do you recomend me because i have 3 year old twins and i think chili powder, chipotle…Will be too strong. Thank you! I think you can omit the chipotle (although it doesn’t make the chicken very spicy, just a hint) and I think you can halve the chili powder. Maybe add in a little onion powder and garlic powder. I think it will be great! Made this tonight with a few variations. I used 2 1/2 tsp. Manjaman Redd Lava Chili spice instead of the chili pwdr, cumin and chipotle. I have been waiting to try the Red Lava spice since we’ve had it at GROW. I also substituted Amy’s organic jarred salsa (not the famous fresh GROW salsa)for the pico de gallo. SO DELICIOUS, easy as you said it would be and HUGE crowd favorite. Chicken was melt in your mouth! I LOVE your substitutions Kathy, and I think using GROW salsa would be amazing! I’m going to make it that way for the Super Bowl. Thank you!! I do not have a slow cooker yet but for whatever reason bought a slow cooker cookbook that gives the recipes to be cooked in either a slow cooker or dutch oven. Have you ever tried slow cooking in your Le Creuset dutch ovens? I live for my Le Creuset Dutch oven. We have not broken up! Yes, I’ve “slow cooked” in that many, many times and it’s still a keeper. I’ve been using a slow cooker for years. Its particularly fantastic for curries, osso bucco and minestrone soup! I just bought a crock pot this weekend! I happened to see it on sale and loved it cause it’s red and matched all my other counter top appliances. I haven’t even had time to look up recipes and here you post one. What a coincidence. And my favorite food too, healthy mexican. Thank you Pamela, can’t wait to try it! What luck! Report back when you try it out! Oh this chicken just looks so succulent! Maybe time to get a slow cooker myself! Which slow cooker did you buy? You made it sound so good I want to get one today!! Deena, just click on the link in the text where I wrote “my slow cooker” and it will direct you to the link of the exact model I have, which is an ALl-Clad. I also provide the link to the ones I got my sisters which is a Hamilton Beach and a lot less $. Hope that helps!